Irtiqa: Tilism-e Hoshruba: "Magic that will blow your senses away"
Tilism-e Hoshruba: "Magic that will blow your senses away"
I was hooked onto reading via Hamzanama - as written in Urdu for young adults. It has 10 parts and, to place it broadly, is the Lord of Rings for South Asia - though it preceded Tolkien. Its not just me. It is quite common to hear people describe Hamzanama as their starting point for their love of books. Two years ago I posted about a new and excellently reviewed English translation of the adult version called The Adventures of Amir Hamza (see Hamzanama: Homer meets Tolkien in Medieval Islamic World). [This tale] has consumed whole generations of readers before you. And like all great tales, it is still hungry—ravenous, in fact—for more. You may not return from this campaign. Or come back so hardened you may never look at stories in quite the same way again. It might seem an exaggeration, but here are the facts: this yarn was spun by two generations of storytellers and it is spread over eight thousand pages in its original Urdu language. At the height of its popularity in North India, it attracted legions of followers all the way from the aristocratic class down to the ordinary folk of the bazaar. In other words: this is a bloody carnival of a book, and everyone is invited. That sums it up, really. Except, during the course of this narrative, our poor fate is in the hands of five tricksters, who are the heroes of the tale: they are spies, assassins, chameleons, and commandoes all rolled into one and their tricks usually involve elaborate plots to overcome the astounding magic of enemy sorcerers. During the mid-nineteenth century in Lucknow, India, where oral storytelling was still a viable career – lucrative, even promising, in some cases, popular stardom and privileged access to the royal courts – two storytellers decided to use an immensely popular oral epic, The Adventures of Amir Hamza, to their own advantage. The two storytellers claimed that they had discovered a ‘lost episode’ of Amir Hamza and appended to it their own ornate edifice: Tilism-e Hoshruba (the usual spiel: grandpa’s trunk, old manuscripts, amazing secrets, etc). But here’s what made them special: they were men with monstrous ambitions and they set out to create the mother of all tales. A clue lies in how they named their epic: Tilism-e Hoshruba i.e., magic that will blow your senses away. Their scheme worked well, and their magical fantasy epic was a smashing success. 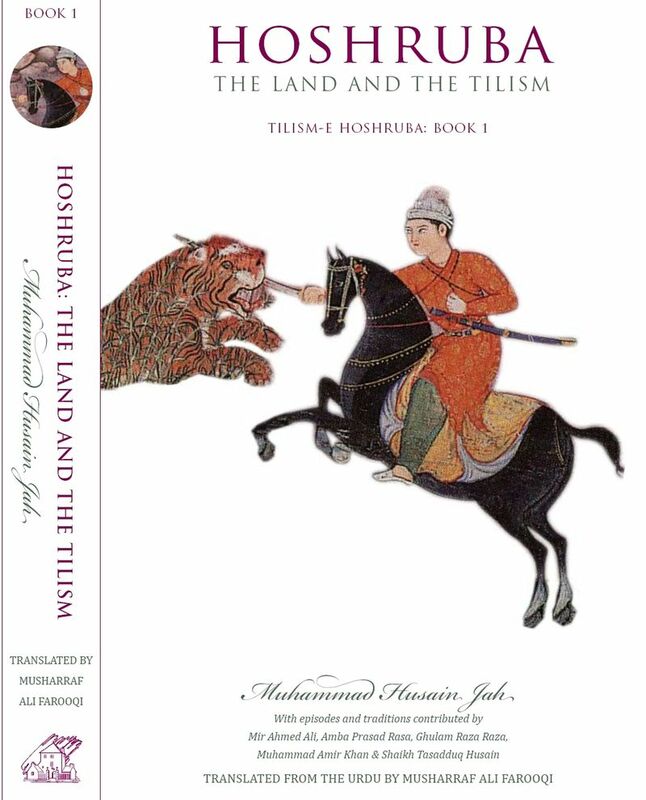 Tilism-e Hoshruba rose to glory with its cataclysmic wars, ornate descriptions of feasts, coquetries of lovers and beloveds, a dazzling array of fearsome sorcerers battling the sly tricksters, their miraculous devices and ingenious plots. The next two generations of readers were entranced by this tale and the Hoshruba storytellers ran a thriving business in the oral storytelling districts of India. The tale was later published in print to immense acclaim: eight editions from Lucknow alone, to say nothing of other North Indian cities. But during the last century, oral storytelling lost its charm as a popular medium of adult entertainment, and the last professional storyteller in India died in 1928, having already abandoned his family profession, taking to selling paan (betel leaf) instead. But Tilism-e Hoshruba survived through a reincarnation in children’s literature: it is still in print in Pakistan in a ten-volume abridged version which is popular with adults as well. Hoshruba’s tricksters and sorcerers are commonly found in pop-lit spinoffs which were a flourishing cottage industry in the nineties, up until the advent of Cartoon Network. Now Tilism-e Hoshruba has finally reappeared, thanks to the labors of Musharraf Ali Farooqi, the premier translator of Urdu into English. 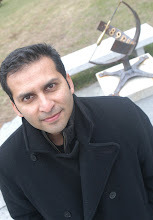 His last venture brought us a first-rate translation of The Adventures of Amir Hamza – hailed variously as a “gift to world literature” (Time), “a wonder and a revelation – a classic of epic literature” (New York Times), “a true marvel of literary and intellectual engineering” (Washington Post). 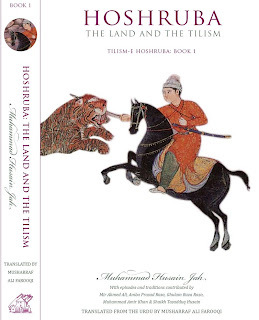 Now he has come out with Hoshruba—The Land & the Tilism, the first volume of a translation of Tilism-e Hoshruba with the next two lined up for this year. But here’s the real problem: after a while, even the action becomes repetitive and seems little more than a reenactment of the same action with different names. What do you do then? Muddle through, like you do with Tolstoy or Mann. The book is four hundred pages and the periods of exertion are necessarily brief. The Tilism-e Hoshruba project is valuable because it introduces to the Western audience something unique, new and strange; something that shakes up the established expectations from fiction and meanings of the ‘literary.’ It would not be entirely wrong to claim that this work fits uncomfortably in the form of a book. It is better imagined as something like a talisman whose function is not to teach, but to charm. Like all great fiction, Tilism-e Hoshruba promises its readers a perpetual dream. It gives us a glimpse of something we find entirely missing from our contemporary condition of disenchantment from the world, i.e., a world enchanted with itself, perpetuating its meaning through an unmitigated belief in imaginative storytelling to bewilder, dazzle, and entertain us. And if fiction is supposed to take us where we haven’t been before, then this “magical fantasy epic” is undoubtedly among the highest imaginative expressions of fiction. But yes, slack is the stuff it’s made of. This translator, Musharraf Ali Farooqi, is beating his kettledrum for this enormous, marvelous, ravenous tale. We must heed his call. And here’s friendly advice: don’t skip the introduction. You will be better prepared to undertake the journey. God speed.